That no-limits mindset, together with lots of hard work under the guidance of his long-time coach Marco Jäger, seems to be serving the 22-year-old very well and is the reason he’s not ruling out the possibility of achieving an impressive fourth European record-breaking performance in 12 months in Ras Al Khaimah on Friday. Since setting a European under-23 half-marathon record of 60:09 in Barcelona last February, Wanders has gone on to break and then improve the outright European 10km marks – first with 27:32 in Durban in October and then 27:25 in Paris on December 30. 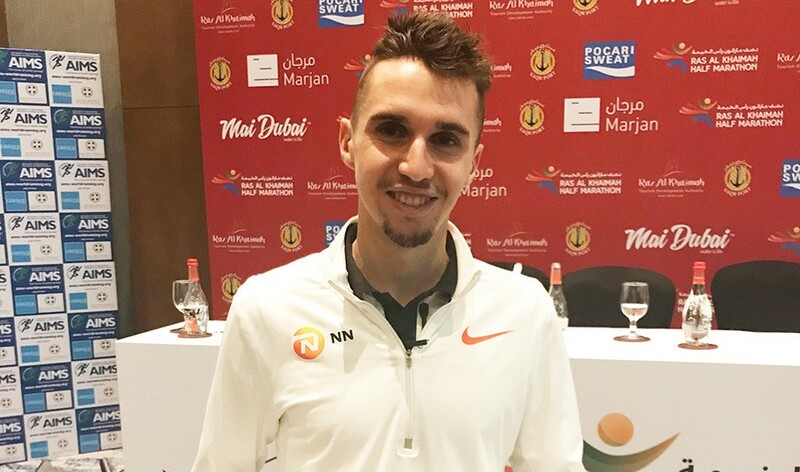 Now he is getting ready to form part of another stacked field for the Ras Al Khaimah Half Marathon, where a total of 13 sub-60:00 athletes will toe the start line. Wanders has Mo Farah’s 59:32 continental mark, set in Lisbon in 2015, in his sights and says he feels in even better shape than he did in Paris just over five weeks ago. “Yes, it is possible,” he says when asked about the possibility of breaking the European record during his trip to the northernmost emirate of the United Arab Emirates. “We don’t know about the weather so if it’s good weather I think it is really possible but I am not obsessed with it – I want to go and try to win the race, that is my main goal. “Maybe my dream is further!” he smiles. “Who knows! Wanders’ pre-race pacing plan also highlights his intention as he is scheduled to run with the second group targeting 59:00 pace. The leading men’s group is set to be led off by pacers at 58:30 tempo, just 12 seconds off the world record set by Abraham Kiptum in Valencia in October. The fastest man in the field is Ethiopia’s world cross country bronze medallist Abadi Hadis, who ran 58:44 when placing third in Valencia last year. His compatriot Fikadu Haftu, who ran his PB of 59:22 in Valencia in 2017, also plans to go with that first group. Two other sub-59:00 athletes are also in the field – Kenya’s Jorum Okombo, who ran his 58:48 in 2017, and his compatriot Alex Korio who clocked 58:51 in the same Copenhagen race – and then there’s Ethiopia’s New York City Marathon champion Lelisa Desisa, who won in Ras Al Khaimah in 2014, plus Turkey’s 2016 European half-marathon silver medallist Kaan Kigen Ozbilen. The men’s race begins at 7am local time (3am UK) on Friday. News on the elite women’s field can be found here.